*You can restore your backups to different devices on the same iTunes account. NOTE: Restoring overwrites and replaces all certificates with the backup version. Tap the folder you want to save you back up to (4) the row will turn grey. Finally, tap “add at the top right of the screen. You will see a message saying “Sucess – Uploaded backup file” when the file has uploaded successfully. 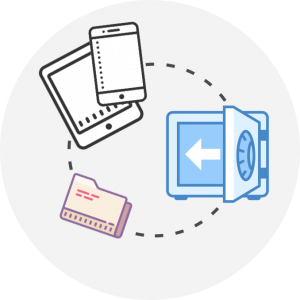 You may find it convenient to create a folder in iCloudDrive for your iCertifi backups. This will make it easier to locate backups. You can even create different folders for year or month etc so you can create separate “save states”.